Last post 04-05-2013 11:29 AM by ciaovelo. 8 replies. 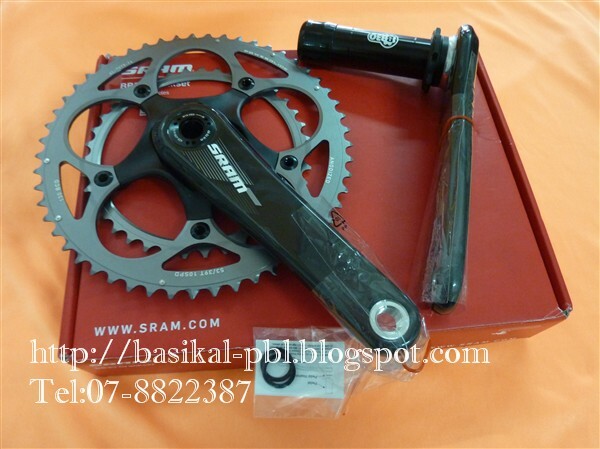 Does any one have an idea as to what is the length of the axle for the Sram Red 2012 BB30 crankset? Just wondering if this will be a direct fit for BBright. I made a call to Sram to find this out, but the guy I spoke to had no idea. I looked up the tech manual for the Sram Red 2012 crankset and the only clue you get is right near the top where the tools are shown or right of the Sram Red wording, read the part that states the "Bottom Bracket Shell Specifications" I think another call to Sram might be the best thing to do especially if you are making a purchase in the dark. What I hope is that Sram develops a crank similar to the S900 around the design of the new Red Powermeter. This crank already shares the crankarm design of the S900, so what it would need is a removable spider and an axle like the S900 which by coincidence works for BBright frames. Thank you Hutch. It seems as if the specs on the BB30 axle length is 68, which pretty much say that it's too short. I do have the impression that the SRAM Customer Service Reps are not up to date with the current information and technology. This is incredibly frustrating not to have information readily available. I'm hoping that someone with some inside knowledge can shed some light on this. The good news is that you can't actually buy it for a few months so there's plenty of time to find the info you're looking for. I don't know if what I found today marks any progress toward a 30mm X 79mm spindle solution for SRAM Red cranks and BBright, but I did find a page on the Quarq site that displays a Quarq spider with 2012 Red crankset (30mm) that claims to work with BBright. I couldn't find any technical data that confirmed dimensions, nor did I find any updates to include BB30 Red solutions for BBright (aside from S950) on the BBright compatibility page. But if it is a fact that you can now fit a '12 Red 30mm crankset to a BBright shell without an adapter I am all over that. Am I misreading something here that has been around all along, or is this something new? Thanks hutch, So it's a '12 Red crankset with a spindle like, and that installs like an S900/950. Plus the powermeter. I wish I'd realized that before I opted for the FSA K-force Light BBright cranset I put on my '12 SRAM Red R5. I had thought the only crank solutions with long enough spindles were S900/950, the FSA BBright cranks, and Rotor 3D+. I like the FSA crankset well enough, but it's a dead end as a powermeter platform right now, and it would be cool to match the the Yaw FD with a BBright compatible (no adapter) Red crankset. I like the FSA crankset well enough, but it's a dead end as a powermeter platform right now, and it would be cool to match the Yaw FD with a BBright compatible (no adapter) Red crankset. In any case, there is still a way you can maximize your YAW FD. Sram began to produce the X-Glide R, a.k.a YAW Non-Hidden bolt chainrings or traditional 5-bolt design. Those rings are shipping with the BB30 S951 cranks that are found on '13 Cannondales and are now "readily" available on Ebay or even some big online retailers. I don't know how "nice" they will look on your K-Force Light crankset in terms of clashing with the red/black/white graphics, but at least the rings are "optimized" to work with the YAW FD. Unfortunately they are only available in 53/39 and 50/34... perhaps in the future Sram will realize that their 52/36 mid-compact combo is becoming very popular these days. Also, on the latest Velonews Sram news http://velonews.competitor.com/2013/04/bikes-and-tech/sram-to-launch-11-speed-red-22-group-hydraulic-brakes_280379 at the bottom there is mention of other '14 future products, which mention a BB30 S902/S952... to me, that sounds like a newer version of the aforementioned BB30 S951 of course, but more importantly it would be interesting to see if they are built around a hidden bolt or traditional non-hidden/5-bolt pattern... I just hope they leave the spindle long enough for the sake of BBright frames. Very informative couple of posts, Hutch. I've seen the X-Glide rings but, honestly, the Yaw FD works so beautifully with the FSA crankset that I'm not in a hurry to change anything until I pull the trigger on a powermeter. At that point I'll most likely go with the SRAM Red Quarq unit with the longer spindle. If that solution installs and works the same as the S950 I had on my R3 for a year, except with new Red rings I'll be very happy. May have to juggle PF30 cups but I'll cross that bridge when I come to it.